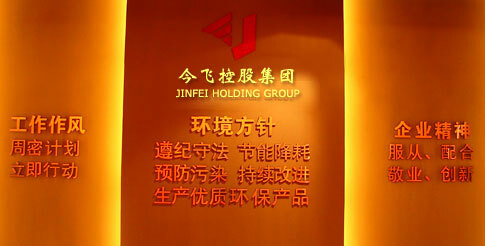 Jinfei Holding Group Co.,Ltd.was founded in 1959. The company is headquartered in Jinhua Development Zone. It has been listed as the major supporting enterprise of Jinhua government since 2000, and has been named as China's Top 100 Auto Parts Enterprises, China's Motorcycle Industry Parts Advantage Enterprises, China's Auto Parts Wheel Industry Leading Enterprises, National Employment and Social Security Advanced Private Enterprises, Zhejiang Province Industry Leading Enterprises, Zhejiang Province Management System Certification Model Enterprises, Zhejiang Province Fine Management Model Enterprise, Zhejiang Innovation Model Enterprise, Zhejiang Patent Demonstration Enterprise, Municipal Excellent Enterprise Jinxing Award, Jinhua Top 10 Environmental Protection Model Enterprise, Transformation and Upgrade Advanced Enterprise,etc. Zhejiang Jinfei Yada Wheel Co.,Ltd. /Jinhua Jintai Auto Parts Manufacturing Co., Ltd./Zhejiang Jinfei Motorcycle Wheel Co.,Ltd./Guizhou Jinfei Wheel Co., Ltd./Yunnan Fuyuan Jinfei Wheel Co., Ltd./Ningxia Jinfei Wheel Co., Ltd./Zhejiang Jinyue Machinery Technology Developing Co., LTD., etc. And the group also owns a branch of Jinhua Agricultural Pharmaceutical Machinery Factory. Zhejiang Jinfei Kaida Wheel Co., Ltd. which is under Group's Aluminum Wheel Division was listed on Shenzhen Stock Exchange on April 18, 2017(Stock abbreviation: Jinfei Kaida,stock code:002863). Jinfei holding Group has many innovative platforms, such as National Accreditation Laboratory, State Enterprise Technology Center, Provincial Key Enterprise Research Institute, Provincial Academician Expert Workstation, Provincial Postdoctoral Pilot Workstation, etc. After more than 20 years of leap-forward after restructuring, through a series of actions such as technological transformation and product structure adjustment, the company has formed an industrial pattern, which is led by alloy wheel industries and aluminum auto components industry, and supported by intermediate alloy manufacturing and equipment manufacturing industry. Currently, the group has established production bases and sales networks in Jinhua, Guiyang, Yunnan, Ningxia, India and the United States. Our products are supplied to well-known OE manufacturers such as Indian Hero, Bajaj, Japanese Honda, Suzuki, Yamaha, Franch Peugeot, Italy BYJ,VW, Beijing Benz, FAW, DPCA, Suzuki, etc. and also exported to more than 10 countries and regions such as North America, Europe, Japan, Russia, Southeast Asia, the Middle East etc. The products and trademarks of the aluminum alloy wheels are recognized as famous-brand products in Zhejiang Province and famous trademark in China. Our "Golden bee" brand motor sprayer won the title of "famous brand product" in China Agricultural Machinery Expo. The company adheres to the sustainable development strategy, implements the quality policy of "pursuing zero defect products, optimizing service and creating brand" and the environmental policy of " Complying with laws and regulations, saving energy and reducing consumption, preventing pollution, continuous improving, and producing high-quality environmental protection products. "A sophisticated IS09001,IATF16949 quality assurance system and a IS014001 environmental management system have been established. The company has also passed the certification of TUV in Germany, SFI in the United States, VIA in Japan, and Chinese National Laboratory. Jinfei holding Group has a highly skilled workforce, exquisite technology and advanced production and testing equipment and is dedicated to provide customers all over the world with high-quality products and services.